Beginning in the 1980´s the world saw an unprecedented liberalization of financial markets. Regulations and constraints were lifted to increase the efficiency of financial markets avoiding the so-called “financial repression”. The roots for these changes in development policy were the theoretical contributions of Ronald McKinnon and Edward Shaw in 1973 (Fry, 1995). McKinnon and Shaw developed theories of financial deepening and asserted that the abolishment of government intervention in the financial market would lead to more rapid economic growth by an increase in domestic investment as well as an increase in the efficiency of financial intermediation in a response to increased competition. It therefore constituted part of the underpinning for a prominent rationale: the Washington Consensus. The term was coined by John Williamson in 1989 to describe a set of policy advices common to three Washington based institutions: the International Monetary Fund, the World Bank and the US Treasury Department. The Washington Consensus is a list of universal adjustments for developing countries to restructure the economy, particularly after an economic crisis and involves a general switch toward market-oriented policies (Gore, 2000). Even though Joseph Stiglitz and others formulated doubts on the effects of financial liberalization based on the presence of information asymmetries as early as 1981 (Stiglitz and Weiss, 1981; Diaz- Alejandro, 1985), it was not until recently that the critique on the unconditional liberalization policies of the 1980´s arrived in mainstream economics (Rodrik, 2006). The key potential of the liberalization of financial markets is a more efficient allocation of investment (Gibson and Tsakalotos, 1994). Financial intermediaries serve the economy by allocating deposits to the most favorable projects, among others (Levine, 1997). Healthy competition among financial intermediaries will improve such allocation by diminishing the interest rate, such that cost of funds for entrepreneurs shrinks. Especially in light of the recent financial crisis, researchers have turned their attention towards the relation between competition and the stability of financial systems. Apparently there are opposing effects at play that lead to a U-shaped relationship between competition and system instability (Beck et al., 2012; Martinez-Miera and Repullo, 2010). The risk policy of banks is crucial for the stability of the financial sector (Beck et al., 2012), and therefore also for sustainable economic development. The risk a bank manages is observable at the default rate its portfolio exhibits. The repayment ratio of loans therefore depends, at least partly, on the risk-taking incentives of banks (Inderst, 2008). Fierce competition may incentivize banks to accept higher levels of credit default to maintain their profitability, as a lasting relationship with the customer is less probable and therefore also less valuable to the bank. As a result, we propose that unregulated competition in financial markets may not always be welfare maximizing; this presents a strong rationale for active regulation. The evolution of Bolivia´s financial sector, for example, shows such a change in lending methodologies. The country was one of the first countries to adopt liberalization policies in accordance with the Washington Consensus to stabilize the economy (Morales and Sachs, 1989). After promising effects at first, the financial industry boomed and interest rates fell gradually, the country was one of the first to be struck by an over-indebtedness crisis in 1999 (Morales, 2007), other Latin American countries followed. The Bolivian financial sector therefore serves as a good example, as it illustrates the possible consequences of financial liberalization, the financial deepening of the economy and the problems associated with unregulated competition. This paper can serve as a theoretical underpinning for the indebtedness crisis in Bolivia, which involves a shift in lending methodologies of financial institutions towards less screening intensity in response to fierce competition. Throughout the paper, we do not consider the related topics of capital account liberalization or financial globalization in order to isolate the effect of domestic liberalization policies, as these are often minor considerations in many developing countries. The main contribution of this study is the introduction of a credit market model with asymmetric information, an informed lender and endogenous credit default. The model allows a theoretical discussion of efficiency gains of unregulated financial markets and its welfare implications. The model is novel, to our knowledge, in treating the default rate of a bank as an endogenous parameter that is determined by screening intensity and lending methodologies. Even though financial intermediaries are perfectly informed about the total distribution of risk among entrepreneurs, they invest in screening to gain information about one particular entrepreneur. This combination of informational asymmetries (Stiglitz and Weiss, 1981) and a better-informed lender (Inderst and Mueller, 2006) presents an incentive to take on higher risks for financial intermediaries at increasing levels of competition leading to more instability. Consequently, we offer a complementary explanation of the relationship between competition and stability based on risk-taking incentives of financial intermediaries and subsequent changes in lending methodology. The second section recaps the evolution of Bolivia´s financial sector, motivating the focus on stability decreasing effects of changes in lending methodologies as observed during the indebtedness crisis in 1999. Afterwards we introduce the related literature to establish the position and research question of this paper. Subsequently the baseline model is introduced and explained and propositions are derived. Next, extensions and variations are discussed as well as assumptions and limitations. Finally the last section presents conclusions and policy recommendations. This section shall present the evolution of the Bolivian financial sector to motivate the proposed relationship of competition and systematic fragility, which will be elaborated throughout the remainder of this paper. The Bolivian financial market is a good case to exemplify the effects of domestic financial liberalization, as it experienced positive as well as negative effects in the course of financial development. Furthermore Bolivia is quite isolated of international capital markets and the financial sector is of national origin in its majority, therefore we can safely assume that international influences such as capital mobility are a minor factor and focus on the domestic market. Additionally, stock markets are not well developed such that the assumption that entrepreneurs turn towards financial intermediaries in the case of an investment need is valid. Hence we assume that the effect of credit market imperfections on the efficiency of investment may be observed accurately in the Bolivian setting. Bolivia’s economy suffered a severe hyperinflation in the period of 1985-1988 as the government relied on the central bank to finance deficits it had accumulated as a result of years of recession, inflation and an exchange rate devaluation that led to a contraction in public revenues (Morales and Sachs, 1989). The financial sector was marked by state-banks and other public involvement, which contributed to the accumulation of almost 40% overdue loans with respect to total outstanding loans (Moretti, 1992). A new government restructured the economy in accordance with the Washington Consensus by liberalizing the financial market in order to increase the supply of financial services and to balance the economy in the long run. The liberalization package included a total cutback of regulations such as the abolishment of interest rate ceilings and only maintained a minimal reserve requirement on deposits (Moretti, 1992). In a second phase after 1987 supervisory agencies were enacted and a regulatory framework elaborated. Following the restructuring of the financial sector, the sector resounded which resulted in increasing levels of M2 and subsequently also investment. This period, from 1987-1999, is a stellar example of financial deepening in accordance with the Washington Consensus. The real interest rate increased along with financial savings and investment and economic growth was predominantly positive and stable until the mid 90´s (Figure 1). Afterwards increased competition among financial intermediaries led to a gradual decrease of the interest rate; the efficiency of investment seemed to have increased. In 1999 the apparent success story experienced its first major setback. Rhyne (2001) describes the crisis as a confluence of two major effects. Firstly, entrepreneurs often avoided loan default by the disbursement of a second or third loan at another financial institution. Banks were granting those second and third loans to maintain their profitability in a highly competitive environment. This resulted in a “bubble” that busted when economic growth contracted, and successively led to uncover the massive level of indebtedness in the society. However, this instability only unveils if macroeconomic conditions contract and a critical mass of entrepreneurs goes default, causing a bust of the financial system related to contagion. Figure 2 clarifies this argument, whereas the loan loss rate and the portfolio at risk at 30 days do not show significant increases as a response to the decreasing interest rate, the ratio of provisions for loan default to operating costs increases. After a peak at times of the indebtedness crisis it is again rising, which is a clear indication of a deteriorating portfolio. Especially as the loan loss rate is only increasing subsequently as the economic situation worsens (compare to Figure 1). This is an indication that the quality of outstanding loans deteriorates even though it is not visible to the public. The “real” quality of the portfolio comes to light once entrepreneurs unpredictably start to default more than proportionally. Secondly, as a result of competition, lending methodologies changed and financial intermediaries put less effort on the monitoring of loans; credit was given out at ever decreasing prices and with less stringency (Rhyne, 2001). The theoretical literature fails to explain such a switch towards more risky banking technologies, consequently this paper will elaborate a theoretical underpinning to explain incentives for increased risk taking at low interest rates. Confronted with price competition banks gave up a special consideration of the default rate they manage leading to more instability in Bolivia´s financial system. For now, it is sufficient to note that the financial literature can only partly explain the effects leading to the bust of Bolivia´s financial system. Whereas excessive lending as a result of a decreasing interest rate has formerly been hypothesized (Beck et al., 2012; Martinez-Miera and Repullo, 2010), a switch to more risky lending methodologies has not been introduced to our knowledge. The latter observation encourages our proposition of changing risk-taking incentives for financial intermediaries under stiff competition. Concluding, the Bolivian experience of financial liberalization gives a good example of the supposedly stability decreasing effects of a change towards more risky lending methodologies. As the unregulated financial system matured, banks lent more excessively and changed their lending technologies in response to the deteriorating revenue position. 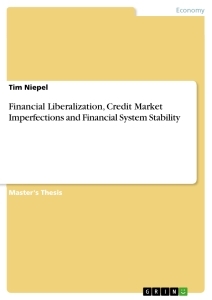 The next section will introduce the theoretical considerations at the root of financial liberalization in order to explain the observations made in this section. It shall thereby identify the shortcomings of the literature in explaining the Bolivian indebtedness crisis and, more generally, the change towards more risky lending technologies as a result of competition in developing countries. These shortcomings will then be explained by introducing a simple model of the credit market. This section gives an overview of the literature on financial liberalization and its welfare effects on the macroeconomic and microeconomic level. However, it only considers domestic effects of financial liberalization and does not tap the rich literature on financial globalization and capital account movements in response to liberalization. This restriction is imposed to keep the scope of this paper manageable and at the same time complete in the consideration of domestic effects. We have argued above that, for the example of Bolivia´s indebtedness crisis, international capital movements and financial globalization are not of vital importance due to the market structure of the Bolivian economy, which is little internationally integrated. Generally we summarize the welfare effects of financial liberalization into effects on the quantity of investment (macroeconomic effects) and improvements in the efficiency of investment (microeconomic effects). Notably, we define the efficiency of investment throughout as a composition of cost-efficiency and the level of credit default. Maxwell Fry summarized macroeconomic and microeconomic effects of the financial system on economic development in his seminal work “Money, Interest, and Banking in Economic Development” (1995). Fry takes into account many critiques of financial liberalization but maintains a clear pro-liberalization standpoint in accordance with the hypotheses of McKinnon and Shaw. Research on the macroeconomic effects of financial liberalization is still summarized well by his work, as there were little recent theoretical contributions in this regard. First he assesses theoretical contributions to the role of finance in economic development followed by a chapter on econometric testing and empirical evidence in favor of financial liberalization that stems mainly from East Asian experiences (Notably in Taiwan and South Korea). Levine (1997) powerfully examines the link of the financial system with economic growth and concludes that institutional factors and the surrounding real economy are decisive for the magnitude and sign of the effect of the financial system on growth. The basic idea of financial liberalization was a reaction to “repressed” financial markets in most developing countries. Financial repression is a situation in which government agents actively participate in the financial system, for example by offering loans with subsidized interest rates for certain sectors or by setting interest rate maxima. Thereby some agents that would be willing to pay higher interest rates or agents that are active in non-subsidized sectors are discriminated in the market for investment (Fry, 1995, Gibson and Tsakalotos, 1994). McKinnon and Shaw argue that this repression reduces the real interest rate paid on deposits thereby limiting the total amount of saving and accordingly the total amount of investment generated by financial intermediaries, which will slow growth (Fry, 1995). Even though McKinnon and Shaw are often quoted together, there are some differences in the motivation of their univocal disapproval of financial repression. McKinnon argues, that as long as the real interest rate on deposits is lower as the real return agents could get by undertaking an investment, they will not save but accumulate money stocks outside of the financial system thereby decreasing the growth potential of the economy (Fry, 1995). Shaw, on the other hand, asserts that financial deepening and resulting competition will lead to a higher real interest rate that encourages agents to save and discourages investment in low yielding projects (the connection between the expected yield of projects and the real interest rate will be highlighted later on). Therefore both researchers independently developed similar theoretical models that give rise to the same policy recommendations: a (principally) complete liberalization of financial markets. Stiglitz and Weiss wrote the most renowned critique of these models in 1981. They argue that market imperfections, most notably adverse selection problems as a result of a better informed borrower, result in an “ upward financial repression ” even if markets are fully liberalized. As high levels of real interest rates motivate some agents with riskier but more profitable projects to invest, entrepreneurs with less profitable and less risky projects will be excluded of the market. This mechanism may lead to adverse effects of financial liberalization, as agents are less likely to save in the light of increased fragility of the investments. Information asymmetries will be revisited and highlighted more in depth in the next section, as they are the basis for screening efforts by banks. For the macroeconomic analysis it is important to note that credit rationing may also be a result of functioning financial markets and not just of government intervention. Other critiques are based around a more fundamental controversy of the proposed model. Economist of the (post-) Keynesian persuasion argue that it is not aggregate saving that needs to be encouraged to increase investment which subsequently culminates in a better growth performance through capital accumulation, but that it is investment that precedes saving in the form of excess economic rents (Crotty, 1980; Gibson and Tsakalotos, 1994). This difference implies that it is not higher but lower real interest rates that enhance the growth performance of an economy through capital accumulation. It is worth noting, however, that there is an array of other critiques on the effect of an increase in the real interest rate. Most prominently the Neo-structuralist school that highlights the importance of curb markets in developing countries. It is argued that an interest rate 1 Many institutions such as NGO´s or supermarkets extend credit without reporting to Credit Bureaus. This point is discussed in section 5.6 and in the conclusion at more depth.